Friday June 17, 2011 Can you name five blessings from your week? 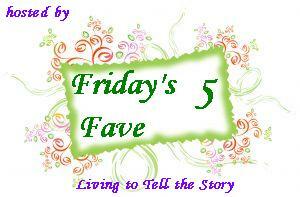 Susanne from Living to Tell the Story hosts Friday’s Fave Five each week. Click on over and see her if you’d like to join in! 1. Chicken Salad and time to fix it. I had to reach my twenties before I’d eat anything with mayonnaise in it, and when I did I realized I liked Chicken Salad. I don’t have fancy recipe – just a combination of chopped chicken, mayo, and chopped onion, celery, and carrots. Since it involves chopping, I often don’t have time to fix it. Now, thanks to summer, I do. And I’m enjoying it. 2. Traveling and a way to write while I do. Yes, summer means travel, and I love that! I used to lug along my big, old, heavy, slow laptop and never used it. Now I have a little, very portable device I can easily use, and I’m so excited! 3. Quiet. Just quiet. Part of summer, for me, is more quiet and I’m reveling in it. 4. Reading. Newspapers, posts, books – you name it. The more I read, the more ideas just flow. I’m enjoying all my reading and all the ideas it sparks. Enjoy the love and the work and the play and the stars this week! I don't know that I have ever made chicken salad, but I like it when I have it. For a while it seemed like every ladies' function at any church involved chicken salad, lol! Recently I've had it with grapes mixed in -- didn't like that at first but I got used to it. I'm glad you got a portable device to write on the go. I revel in quiet, too. I seem to just need doses of it to stay sane. Yay for chicken salad! I had a really great one recently and your fave reminded me to make some this summer! I love the rest of your fives -- they sound just like what a lovely summer should be. I love chicken salad. The best one I had also had grape halves in it. Very yummy. Some quiet and travel and reading sound good to me. i love all the things you listed! and that quote is awesome!! yes, I'll try to post pics but have been a bit busy so not blogging as much...will definitely post a pic of the backyard on July 9 the day of her grad party...and I'll try to post a couple of dance show, and elementary grad pics as well.....it's an emotional time but God is soooo good!! Chicken salad... YUM! I must be hungry since everyone's food gratitude is really resonating with me tonight. Thank goodness for quiet time and the relaxation of summer. Have fun with your new traveling portable writing thing! Have a good week! Love, play, work--they are all worthy endeavors. Your week sounds wonderful--quiet and reading--love it! I'm glad you found a great device for writing. Even a laptop is a lot to lug around. Sounds like a great start to your summer. Where are you travelling to? I bet one place is to see that grandson of yours. Tonight, I almost wish I could put 'quiet' and 'reading' on my list. Well, reading is something I do always, but it would be nice to just sit and read all day if I wanted to. But...I'm not complaining - the quiet and the time to read is traded for having 4 (almost 5) extra people living with me. Much better than having them on the other side of the world! I love the quietness of summer also. I love to sit out of doors and listen to the birds or a train going by on the other side of town. I remember reading that quote when I was a teenager. I think I had it copied into one of my journals. Summer is wonderful!! My favourite season. I got a new, lighter laptop last year and I'm really enjoying it! Love chicken salad - and I have some cold chicken so I think I'll make some today. Love the quote Laura! Hope you find time this weekend to look at the stars! I still have yet to make chicken salad, but I finally learned to eat it. Progress. I love chicken salad too and have recently started making it with half greek yogurt to cut down on the fat. It does take some time to make though. I love the quietness of summer evenings, so nice.